Stanley Baker stars in a tense and dramatic Brit-crime thriller from director Cliff Owen. Odeon R2 DVD. 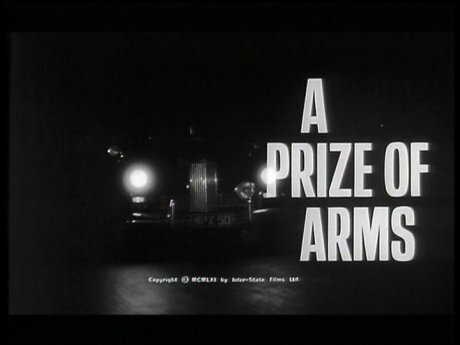 Co-scripted by future director Nicolas Roeg, A Prize of Arms takes a pretty standard heist story and makes it into some very impressive cinema. We do not waste any time before the start - a short sequence during the credits shows the team preparing the night before and then discussing the job - within 15 minutes it has all begun. By focusing entirely on the three characters for these opening sequences we genuinely care about them by the time the job starts, helping to give the film a real layer of tension throughout. The trio avoid the usual clichés and are presented as just being three normal men who have found civvy street not to their satisfaction - none of them are pros, none are psychotic killers, none are trying to be honest men. The full extent of their plan is slowly revealed as the film progresses and it is clear that the characters have planned every detail - as expected though, things go wrong and the film really builds the tension as the trio try and recover without being exposed. There is a lot of bad luck and even more good luck, but it always remains realistic and plausible and there are none of the jumps in logic that ruin many other thrillers. Once the heist has taken place we are introduced to a variety of army characters in an effective way - the script never tries to make them characters but instead lets us see how the investigation is progressing and again helps to avoid any potential plot holes. The pacing is on the relatively slow side but the film certainly never drags and it climaxes superbly - although as seems to have been common at the time, the very ending is a little sudden. Director Cliff Owen was more at home on the television screen but manages to do some solid work here - he is aided by being allowed to film on what at least appears to be a real army base and with a budget for plenty of extras and military equipment that helps to give the film a very realistic look. Although black and white photography was on the way out in the early 1960s it is used well and really fits with the generally grim tone of the film - fortunately, although much of the film is shot at night, there is no day-for-night photography and no dodgy optical effects in the driving scenes. Composer Robert Sharples gives an unusual mute trumpet soundtrack, rather remniscent of the Film Noir days but one that suits the film well. Stanley Baker was one of the biggest names in British cinema at the start of the decade and Prize of Arms makes a perfect vehicle for his tough, realist talents and he gives a typically strong performance throughout. His partners in crime are the little known German actor Helmut Schmid and Tom Bell who had previously appeared alongside Baker in Criminal (1960) - they both give convincing performances. A number of familiar faces appear in the army ranks, most notably Patrick Magee and Michael Ripper. All of the military roles are played with conviction and help the authenticity greatly. A pretty typical heist story gets a uniquely strong and realistic script, the director keeps it authentic and gritty, while Stanley Baker gives another superb performance and is well aided by the rest of the cast. A real gem for fans of Brit-crime, heist films and Stanley Baker - certainly recommended. Fans of Brit-crime, heist movies and Stanley Baker will certainly enjoy this. Visuals Cropped ratio - 1.33:1 fullscreen. Black and White. The print quality is acceptable and always watchable. There is some fading, often quite noticable in the nighttime scenes and minor damage throughout. The opening credits are approximately 1.78:1 which would seem to be the Original Aspect Ratio - cropping is quite noticable throughout the film. The disc includes trailers for Odeon's Comedy, Thriller, Mystery and Northern Comedy boxsets. A booklet is included with three pages of notes about the film and cast. A solid and realistic crime film, boosted by strong direction and acting. Recommended. The print is not perfect and the fullscreen cropping is quite noticable but importantly the film is always watchable and miles better than a PD print or the VHS transfers that were the only way to see this film before. Find our reviews of other films starring Stanley Baker. All text in this review written by Timothy Young - 2nd July 2008.